Happy fourth of July, all! I hope you enjoy barbecue, beer, fireworks, friends and family. Stay cool out in the heat today and be safe. Standard, which at one point was going to be a burger place modeled on New York’s shake shack, is now open in the old (old) Garden District space at 14th and S. The restaurant now is barbecue based, with very odd pricing. Check out the menu – what is wrong with having rounded off numbers? I walked by this weekend and it was packed with people enjoying the weather and beer. I’ll be sure to stop by soon – but have you been? What did you think? After applying for a liquor license, I’m happy to say Pica Taco (14th and Florida) is now serving beer. They have bottles of Corona, Dos Equis, Miller Light, and Negra Modelo available. So next time you stop in for a taco, sit down and enjoy a beer as well. Last week, in the midst of the glorious warm weather (sigh, are you missing that? ), a few friends and I went to American Ice Company (10th and V Street) for the first time. The place was understandably crowded given their large outdoor space: they also have a garage like window that they opened up, so that even if you were sitting inside you felt like you were outside as well. We snatched a table and ordered some beers: they have a nice selection of pretty affordable choices (but Guinness is $8 there – what?). I’m pretty sure our waitress used to bartend at the Gibson, I’ve had her a few times and she was excellent, so the bar for service was set high. Unfortunately, it wasn’t met – she had trouble hearing our orders because it was so loud, and for some reason didn’t write anything down. I ended up getting charged for a beer I didn’t order and we had to correct that. Certainly, at a more down-home place like American Ice Company the service shouldn’t be on par with the Gibson, but I was a bit disappointed. We also ordered some food: pork sandwiches, the turkey plate, chili con queso, and of course the pickle platter (if you know me well you know I love pickles). 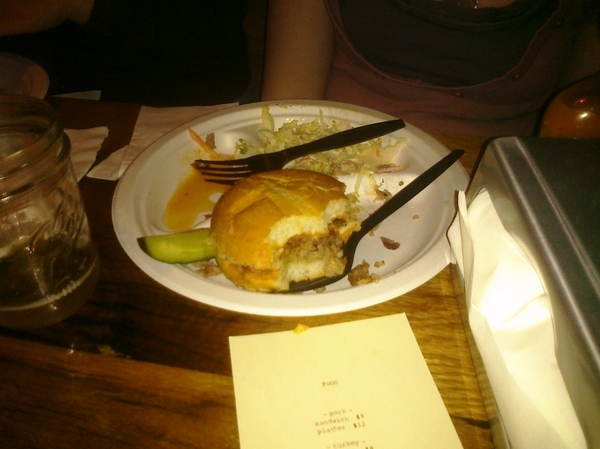 The barbeque style food was good, but didn’t blow any of us away. I might be from Massachusetts, but I think I know barbeque pretty well and while the ‘que was good I imagine it’s not going to draw barbeque enthusiasts in. Overall, American Ice Company is a fun place to meet for a few beers and food, but it gets crowded pretty fast and I’ve heard is intolerable during weekends, unfortunately like most of our bars in the U Street area. Their name and the day they are opening are very appropriate: it’s so freaking cold outside. American Ice Company (Vermont/V), the bar/BBQ joint from the Hilton brothers of Marvin, etc. will be opening Thursday Wednesday. Thanks for commenter Katie for pointing me in the direction of this TBD article that quotes the owner as changing the date to Thursday. If you stop by, let me know how it is in the comments. I haven’t covered this soon-to-open business as well as I’d have liked, so here is an update. American Ice Company, coming from the Hilton brothers of Marvin, Patty Boom Boom etc. fame, will be a barbeque and beer joint at V and Vermont. American Ice Company will have a fairly large outdoor seating area, which lead some area residents to complain about potential noise issues. Prince of Petworth has photos of the interior. 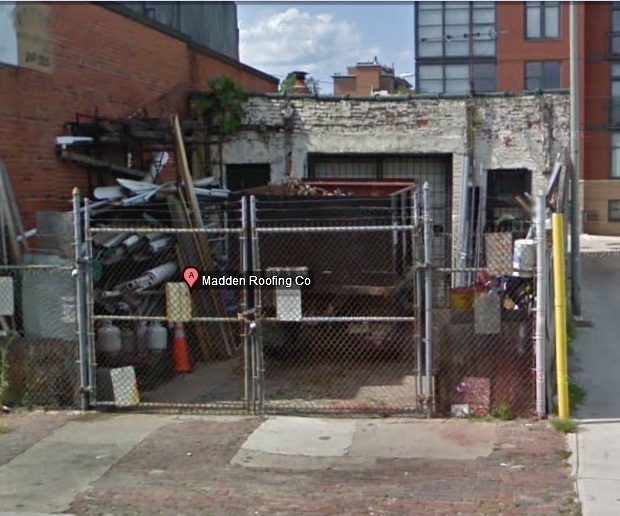 It looks pretty nice, with a warehouse, eclectic vibe. This Saturday is Columbia Heights Day and the inaugural first DC State Fair (yes I realize that’s a bit of a misnomer). From 10 am to 6 pm, throughout Columbia Heights, there will be events at Bloombar (yoga, live music), contests at Tubman Park at 11th and Irving (dog show, cupcake eating contest), and specials at a lot of local restaurants (Wonderland Ballroom, CommonWealth, Meridian Pint). Local food bloggers Gradually Greener, Modern Domestic, and the Indoor Garden(er) are putting together the DC State Fair – events will take place at Tubman Elementary Field and will include a pie, jam, home brewer, pickle, biggest vegetable, and best tomato contest. Amen Amelia! I’m excited to check everything out, it sounds like the weather will be perfect Saturday – so see you there!